With co-author John P. Holdren, in Saturday Review (5 June 1971), 54, 59. 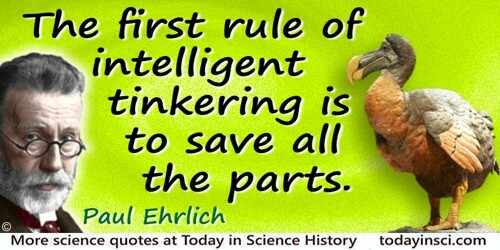 Ehrlich is making his own paraphrase of an earlier quote, citing Aldo Leopold: “To keep every cog and wheel is the first precaution of intelligent tinkering.” See the Aldo Leopold Quotes page of this website. These refer to the importance of supporting an ecosystem by keeping all its parts - saving all the species. The human mechanism is marvelous. But why not—it is the result of three-and-a-half billion years of tinkering. Epigraph in Isaac Asimov’s Book of Science and Nature Quotations (1988), 12. Through most of his existence man’s survival depended on his ability to cope with nature. If the mind evolved as an aid in human survival it was primarily as an instrument for the mastery of nature. The mind is still at its best when tinkering with the mathematics that rule nature. In Before the Sabbath (1979), 26.